Posted on March 21, 2016 at 12:59 pm. Thrills Casino are counting down the days until Easter with a calendar of bonuses for you to crack open every day up until March 27. The prizes range from free spins, cash bonuses, and other thrilling rewards but these ultimately depend on your position on the Bonus-O-Metre – in other words how much you have already played at Thrills before. If you are a new player, the daily rewards will be structured around this (such as a higher matched deposit bonus than the welcome promotion), so if you want to earn better rewards sign up and play the selected Thrills Casino game before cracking opening the prize each day. Then head to the calendar, click on the day (Day 3, Day 4, etc) to reveal your prize. Thrills online casino was one of the first to change their loyalty program and offer a new way for players to climb their way up to VIP status. The Bonus-O-Metre works with the team at Thrills picking a special pokie (one with a bonus round) each week, which appears in the lobby once you log in. As you play it, you will earn a special prize for unlocking the Bonus round and the more you hit this round the higher you will move up the Bonus-O-Metre. This week’s selected pokie is Play’n Go’s new title Cloud Quest. This pokie is incredibly unique with a 5×5 grid layout instead of the usual reels and an array of bonuses which tie in with the theme, including superpowers to create bigger wins. The Bonus Round is extra unique as the grid transforms into a 3 reel and one payline pokie where you can win up to 20 free spins – plus an additional three every time you defeat a monster by spinning a special symbol. There is a minimum bet for the Bonus-O-Metre, set at $0.40 per spin, in order to qualify, but as you unlock the bonus rounds and fill the metre up you will also unlock treasure chests which offer a huge number of free spins. Additionally, as we mentioned above, you will earn yourself better prizes for when promotions such as this Easter calendar come around, with Thrills offering regular promotions all year round. 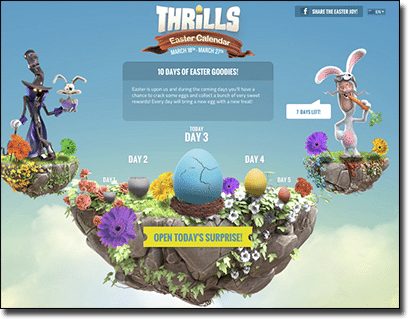 If you aren’t a member of Thrills.com yet, click our links to sign up in just a few minutes and either head to the Easter promotional page via the link in the lobby or get playing Cloud Quest to earn your status and crack open the best possible rewards this Easter.